With banners and slogans against sexism and related crimes, thousands protested in Spanish cities on Sunday to mark ‘International Day for the Elimination of Violence against Women‘. 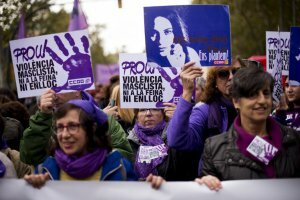 Protesters took to the streets in Madrid, Barcelona, Sevilla, Valencia and Bilbao, reflecting how the fight to stop violence against woman has become a national cause in Spain. ‘We are here for all those woman who have been murdered, in Madrid and in Spain. We are taking it very personally,’ said Rosa Orea at the Madrid rally. ‘The situation has changed for our generation, but we have to keep fighting, because this (violence) happens more than it seems,’ said Sofia Serrano, a Madrid student. Prime Minister Pedro Sánchez on Sunday reinterated his government’s ‘commitment’ to eradicate violence against women and ‘culture’ of sexism.